The market had a stronger sell off today that ended below the Trend Average by closing at 2058. Still, the expected move from 2093 is a zig zag so far and we should see another bullish wave to a new all time high as long as the Trend Average does not turn bearish. If the market fails to counter rally substantially in the next session or two, then a bigger correction is likely. Returns on the S&P 500 were 13.75% for the year (not including dividends), which is an above average year. The cumulative returns for the entire bull market since the 2009 low is 212% and fundamentally speaking, the market looks to me like it still has more to go. With that said, market cap to GDP is the second highest in history at 1.27 and I won't be surprised if the market goes all the way to its all time high at 1.55. The one thing that helps this huge market cap rate is the fact that at PE 18, the market is barely above its long term average of PE 16. So if profits can continue to grow as they have in the past few years, there's really not much of an excuse to sell stocks. 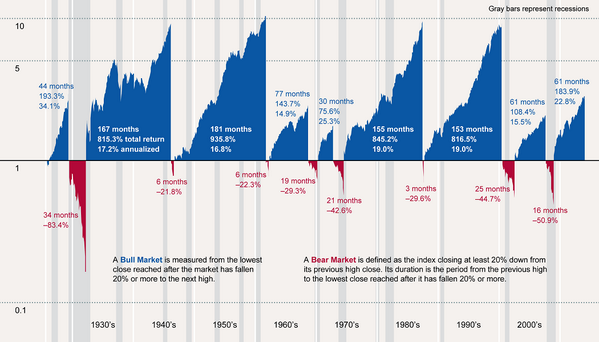 Also, relatively speaking, this bull market is average time wise and could go on for a lot longer. I was fortunate to beat the SP500 performance overall and had my China longs tracked the SSEC more accurately, I'd be at my retirement goal in the next few months. As it stands, I need to grow my portfolio 35-40% to reach my goal. So I hope I can get a 12% annualized return through 2017 (my original target retirement year) or perhaps have a huge 2015? whatever the case, I am very grateful for where things stand. Happy New Year and hope 2015 will bring you lots of happiness, health and wealth! 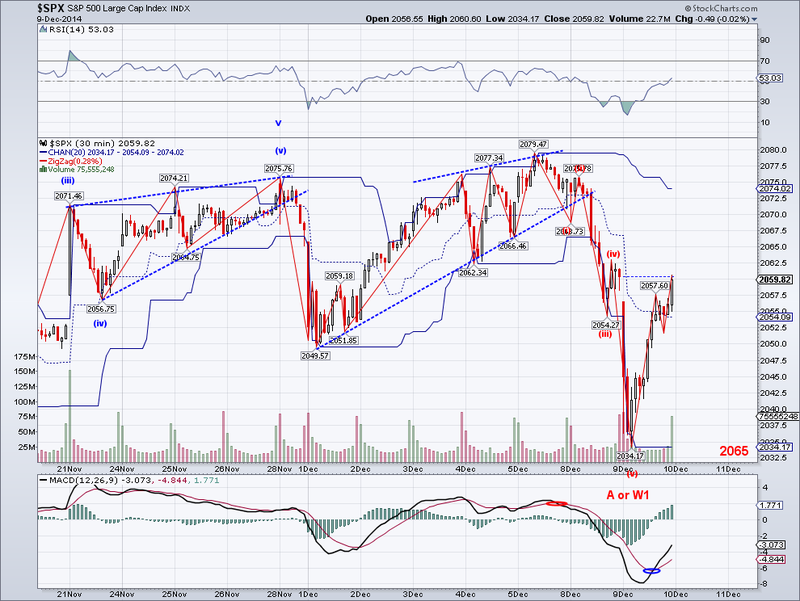 The market rolled over as expected and so far it is looking like a W4. This is the first "significant" daily drop in almost 2 weeks and chances are upside will resume in the next few sessions. 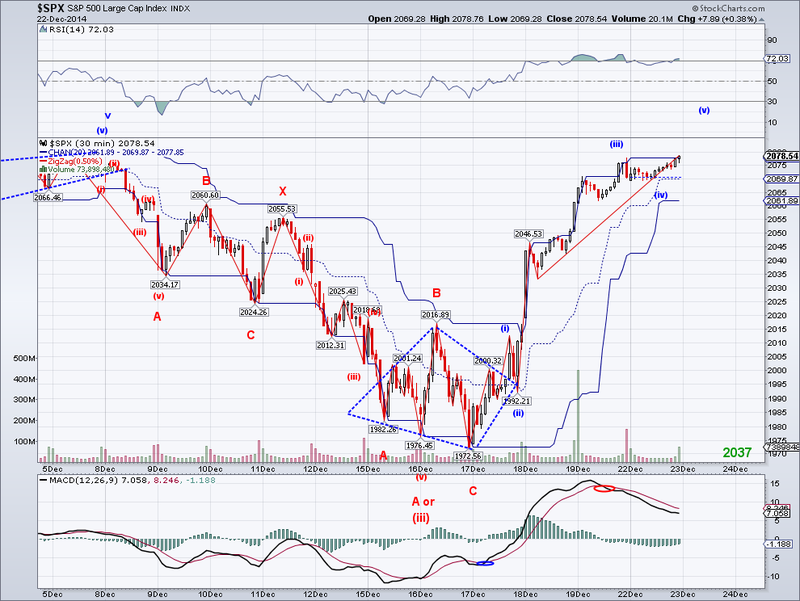 Once we get 5 waves counted, then we can start projecting downside for the correction. But I wouldn't be surprised if we get a bullish January considering the momentum and the fact that this intermediate wave from 1972 has a good chance of being a bullish W3. Specially, since fundamentals look strong for the US economy in 2015. Demand is expected to grow, the problem is supply is growing faster. The extra supply is about 1-2 million barrels out of 90 million barrels per day produced worldwide. OPEC doesn't want to be the only group cutting, so Non-OPEC producers need to come up with a plan to make it viable for everyone to produce without undercutting each other. Once that happens, oil will be going up if demand grows as expected. Mark my words. 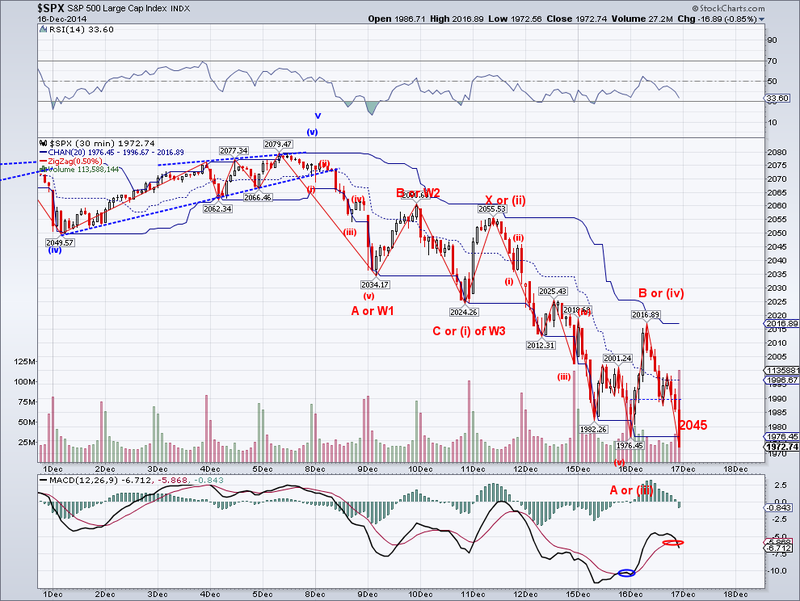 The market has continued to make new highs as expected and it doesn't even look like the W3 is done. Also, the RUT made new all time highs, so all markets are now in synch on this bull run. I ended up stopping out of my oil position (at a profit) on today's oil sell off. 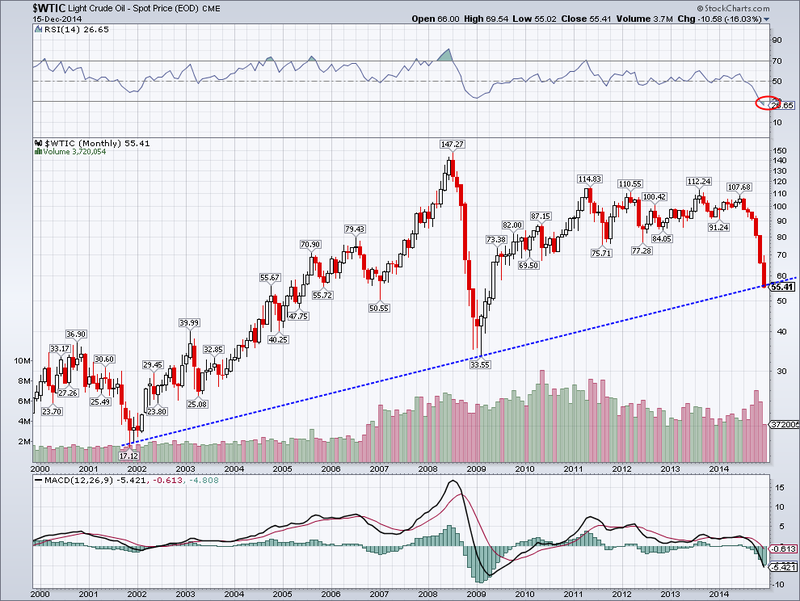 It looks like oil has been triangulating and there will be one more leg down that could find a significant bottom. Perhaps that expected bearish leg in oil will be the excuse for a mild correction in equities. The market continued to rise to a marginally higher new all time high and it looks like there will be a bigger bullish leg coming up soon. I changed the micro labels because of the way some oscillators are behaving. Normally, whenever oscillators reset with rising or sideways prices, it usually means another price advance. 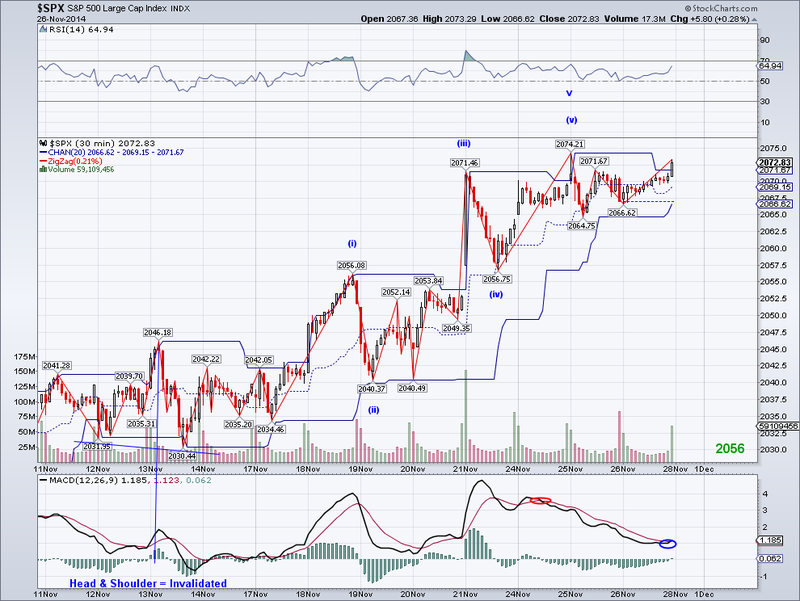 I suspected this wave was going to behave like the previous one (1821-2079) and so far it's looking very similar. So, we might or might not see a correction on this advance and I won't be surprise if the structure matches the previous advance, which would put the market at 2230 (1972+258) and perhaps complete LT INT 3? However, considering this is the 5th of LT INT 3, this could well end up being rising wedge and we would get a lower target. 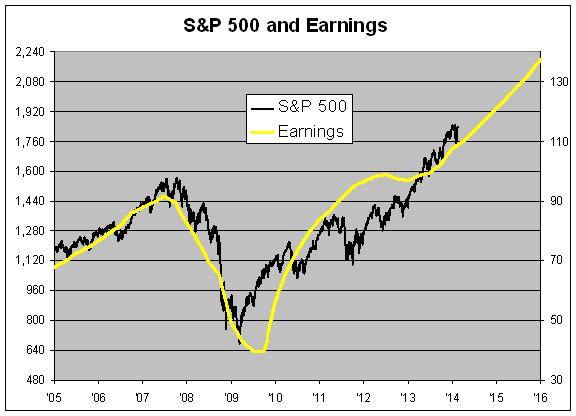 I meant to post an earnings chart I found recently but I don't know where I placed it. But I found the ones below that basically tell the same story. Currently, the market is trading around 17 PE (assuming $120 total 2014 earnings), this in a year with 2.5% annual GDP growth (perhaps a little more). Next year, the consensus is about 10% growth in earnings with a higher projected growth rate for the economy at 3%. So, if we use the same PE ratio we would get 2244 at the end of 2015. What remains to be seen is Q4 results to get a better picture of what the total earnings for 2014 actually are. Also, the historical PE is 16 so technically speaking the market is not that far ahead. We could see PE contract next year or expand and my guess is it will depend on general investor enthusiasm. Also, I wanted to point the following out as it is very important. 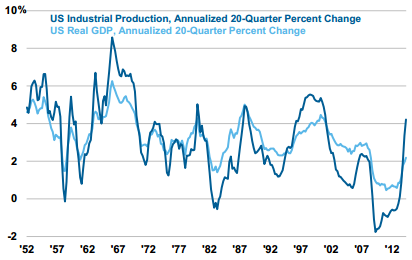 Industrial production is growing faster than GDP, the most in decades. This explains the faster earnings growth vs GDP growth. There are several factors for this and lower oil prices will generally help expansion due to lower costs. The market made an official new all time high as expected and chances are there are many more to come. There's now a bullish cross on the daily MACD and this could easily mean 100+ points before the next rollover. So it looks like this rally will last for a few weeks, possibly into the end of January unless a significant bearish event happens between now and then. But considering the economy just had the best quarter in 11 years and all the extra disposable income resulting from low oil prices will be reflected next quarter, bulls have strong fundamentals backing their case. I have a projected earnings chart that I will post tomorrow to get an idea of what levels the market might be pricing in. Also, oil rallied today so I am raising my stops to break even. I just need prices to break resistance at $58 and there will be a bullish daily MACD cross there as well. The market closed at an all time high and a new highs are being put in after hours trade. I think the little sideways correction today could count as a micro W4, but so far this structure reminds me of the last wave we had from 1821-2079, which kept grinding higher and higher after mild corrections. And considering there are many fund managers behind the SP500 performance for 2014, many might be forced to buy more in fear there will be no pullback. Also, oil fell substantially today and the market barely blinked, so there isn't much bearish hope other than the market being overbought. I ended up buying oil today because of a potential triple bottom reversal (the risk is that it is a descending triangle), so hopefully I can milk a 10%+ run from today. Lastly, I posted this over the weekend but I had to revise one of the charts, so here is the post again.. things are looking very bullish at the moment. I haven't updated this chart in a while but here it is. Now that I think we have a LT INT W4 in place (1821), we can start preparing for the end of the entire move from 1075 in back in 2011. 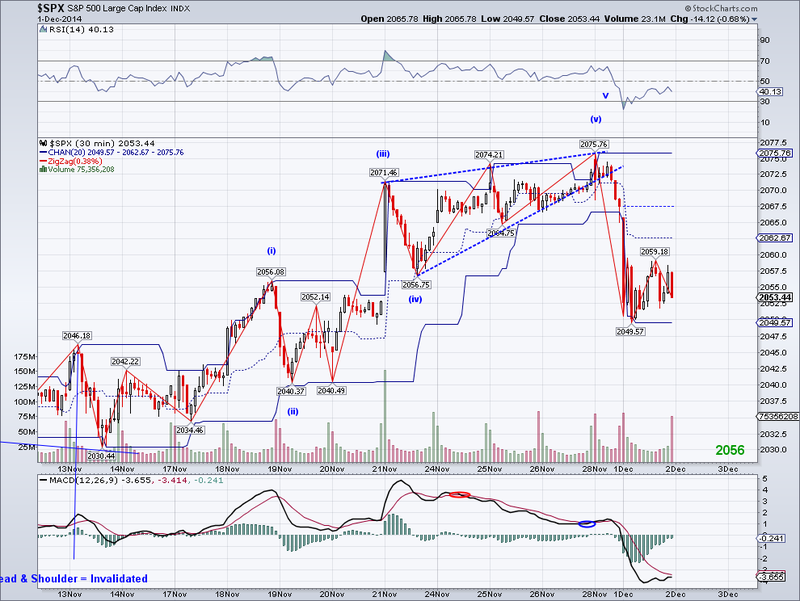 Assuming this final wave is the same as W1, then the ideal target would be 2168. On the longer term, the target I mentioned on Friday (2485) looks very possible with this long term count, which I have not really altered in over 3 years. 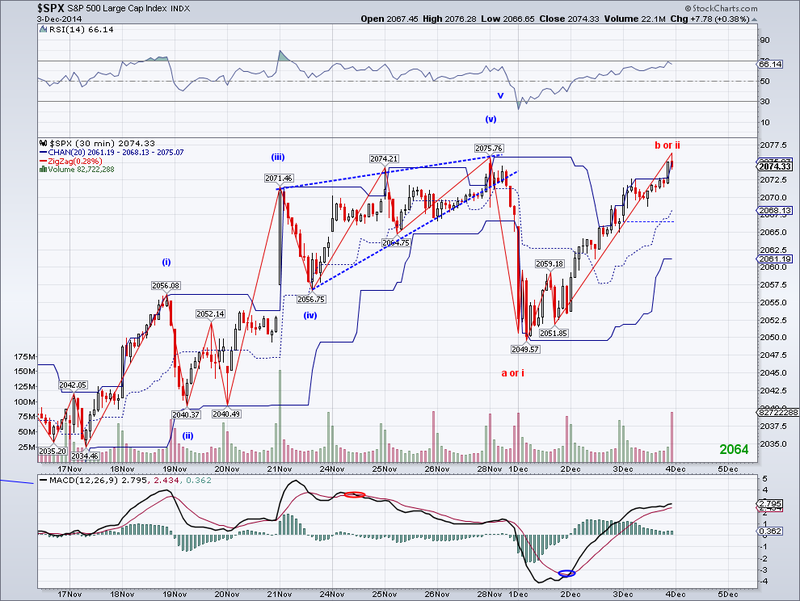 But that should come after a top for LT III wave and the following LT IV to reset long term oscillators. 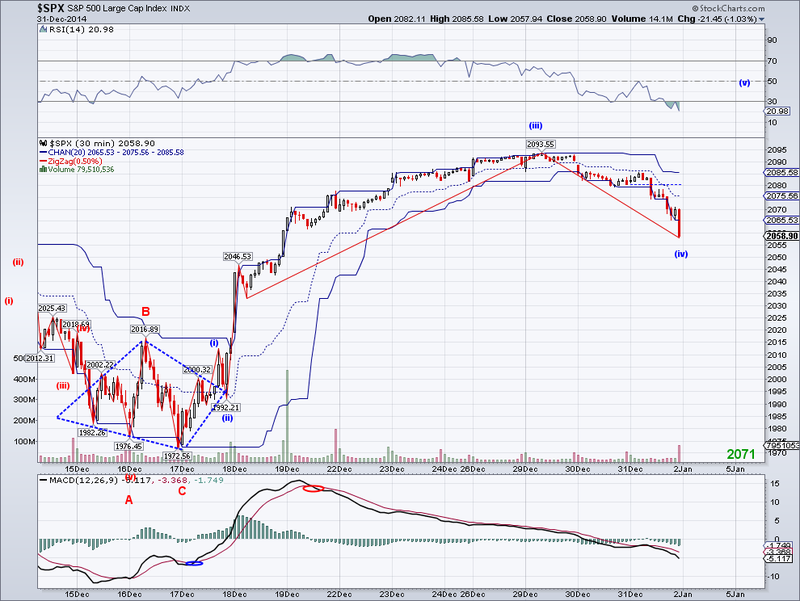 Also, I wanted to post the Inverse Head and Shoulder's I've been mentioning in the last few weeks. 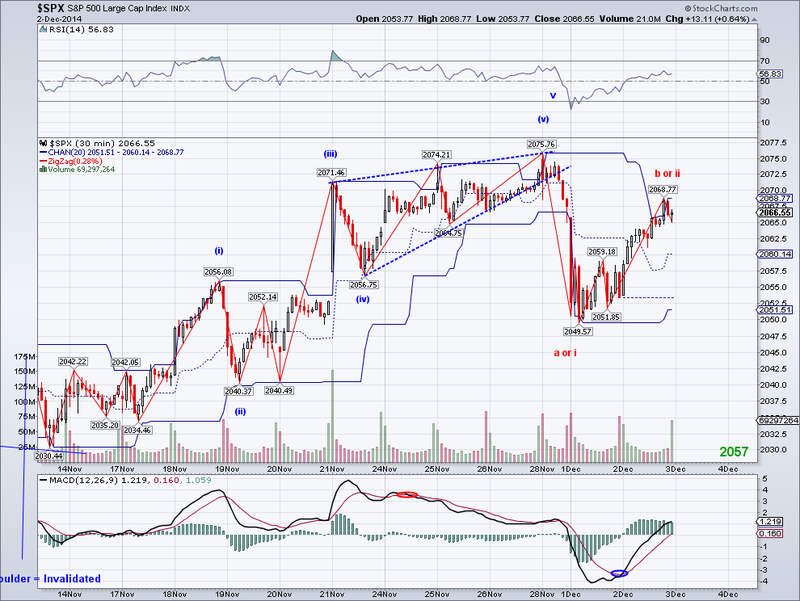 I assumed most people knew what I was talking about, but since it is a sloping IHS, it might not be all that clear. This pattern is targeting 2277, which sounds ultra bullish but if you add the length of the rally from 1821 to the 1972 low, you see it almost gets the market there. 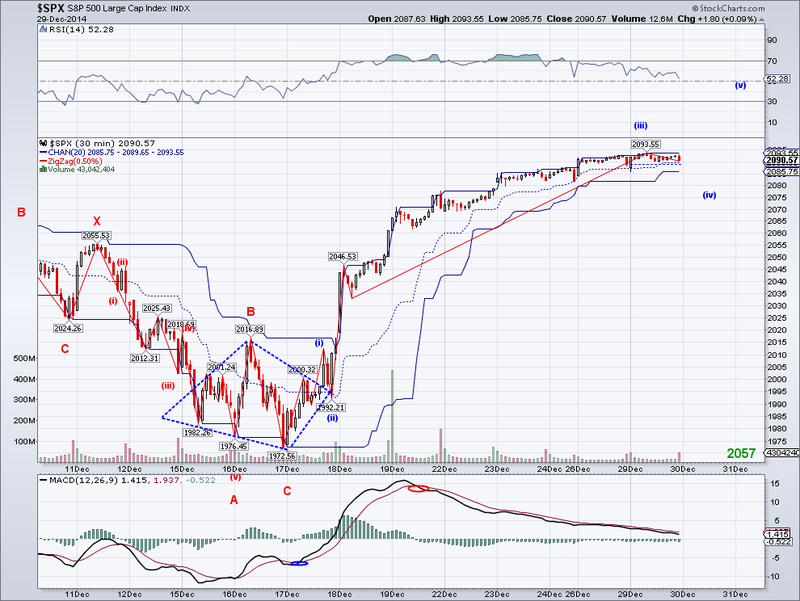 This would overshoot the "ideal" target 5th wave target, but that's what final waves do sometimes. The market challenged its all time high as I expected in the cash market. But in pre-market, there was a new all time high last night, so there's a good chance we'll see more ATH next week with a Santa Rally. I still don't see any signs of a micro W4 and this could easily turn into what I call a "stand alone W3" given the momentum this rally is carrying. This week's rally is the strongest in 2 years and we could be seeing the start of a W3 at the intermediate level given the Inverted Head and Shoulders in place, so be careful with those shorts (that is if anyone is brave enough to be shorting this). Also, I wanted to elaborate more on the long term pattern since it looks very likely now that the 2484 target might be reached in 2015. I didn't explain yesterday how I came up with the number but this is all based on the broadening triangle pattern, not on Elliott Wave. 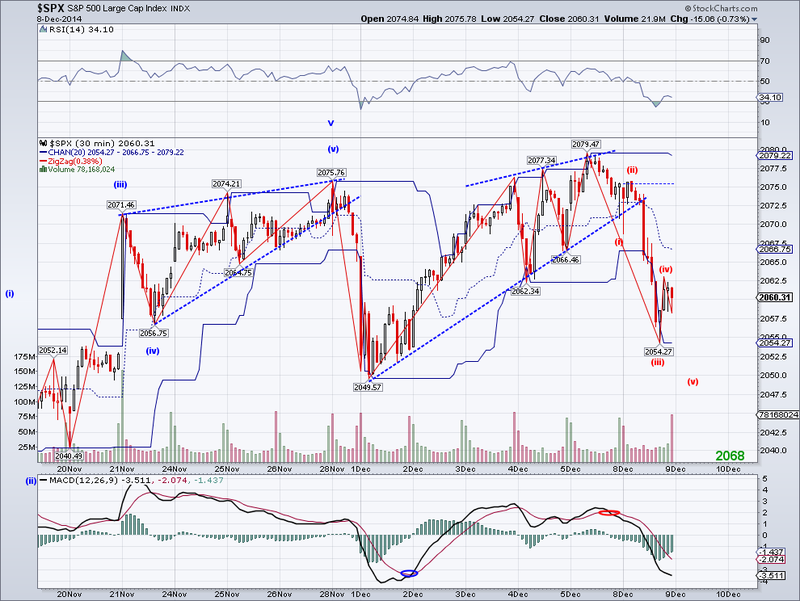 Basically, you subtract the low from the upper trendline and then add it to its break out point. At 2400-2500, market cap would be near or at all time highs relative to GDP and it would be a great time for a bear market to correct all the gains since 666. But one can never really be sure using Elliott Wave or fundamental opinions, so the best as I've always said is to follow the trend. Also, I should add the next bear market is likely to be a correction and not some catastrophic sell off as orthodox Elliott Wave calls for. Very long term counts (Cycles, super cycles, etc) are inherently flawed and should never be considered, much less traded. 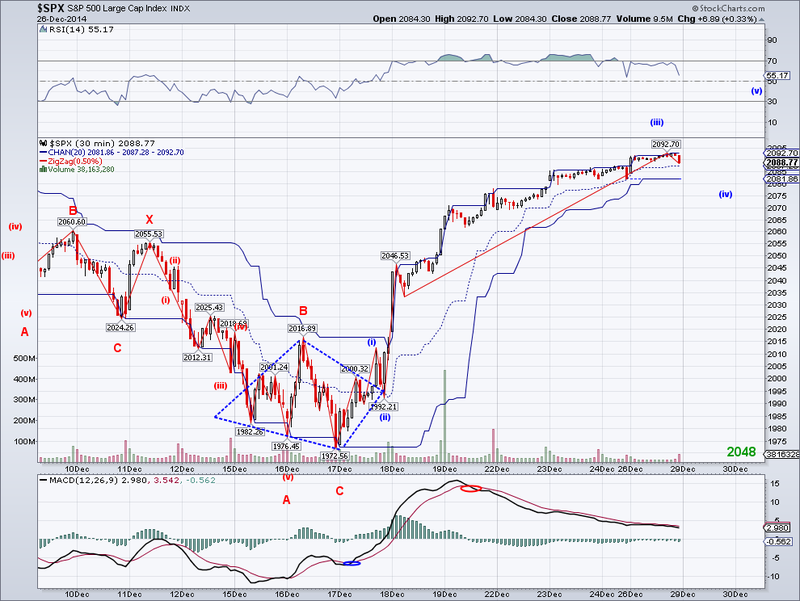 Otherwise, one would be stuck calling for a top every other week like Mr. Elliott Wave himself, Robert Prechter. 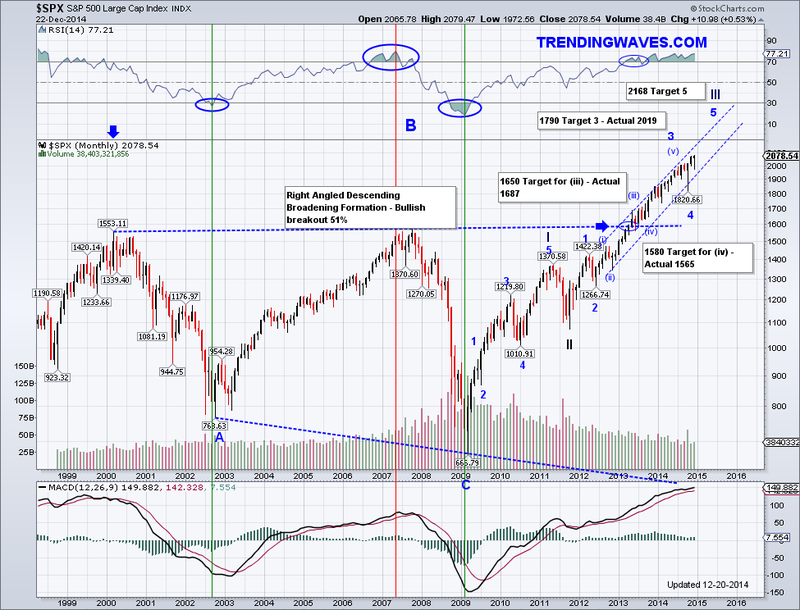 Who has been calling for a top for the last 25 years and most recently in September in his "This is IT!!" newsletter edition.. I'm sure he'll be calling for a "point of recognition" again next week and the week after.. the man takes insanity to a new level. If there was any doubt 1972 was a bottom, today's desperate buying should be a clue. The market has had the best two day rally in almost 2 years and chances are the rally will continue for the remainder of the month with or without a pullback to the Trend Average/2024-2034 level. Technically, I could label the micro waves from the bottom as a completed 5 wave structure but I lean towards seeing the all time high challenged on this wave. Also, I was looking at charts from the past and I found this one below that I posted more than 2 years ago. Back then, I proposed the similarities between the patterns at that time and the correction that took place in the 1970's. Looking at it now, it seems obvious this pattern is going for its technical target of 2484. Back in 2012, not too many people were favoring a break out (most expected "Bearish P3") and the idea of 2484 sounded insane.. but it doesn't look so crazy now. The market seems to have found a bottom yesterday and now there is a diamond bottom pattern in place, so timing couldn't be better for a Santa Rally. 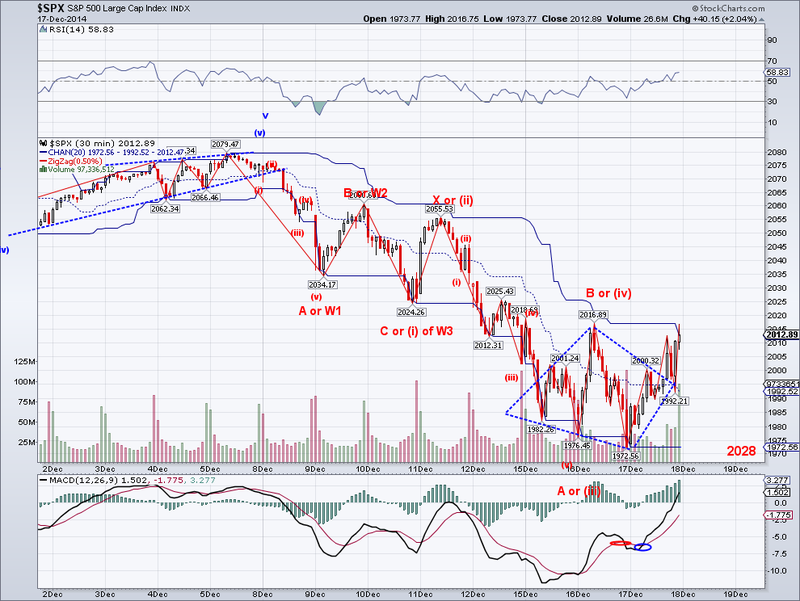 Obviously, I want to see the Trend Average turn bullish before confirming the end of the correction. 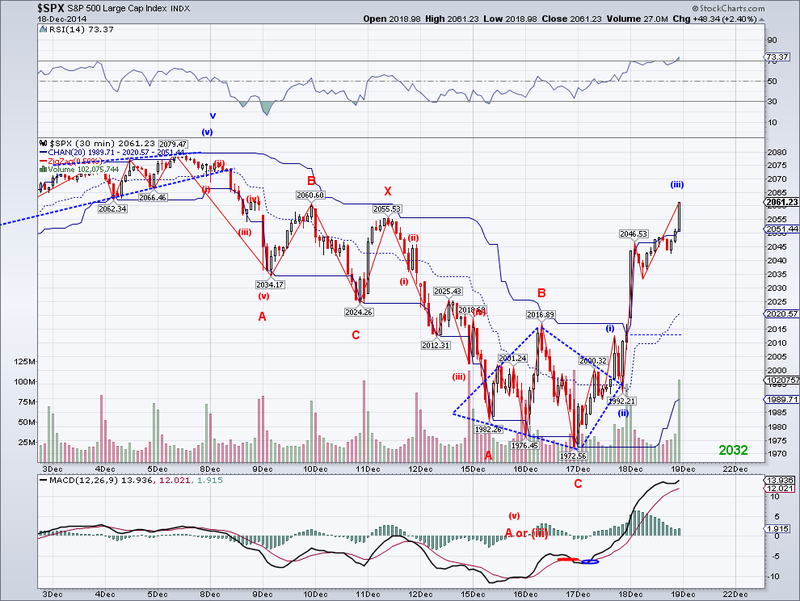 But so far it is looking good for the bullish case as it is going as predicted few weeks ago. 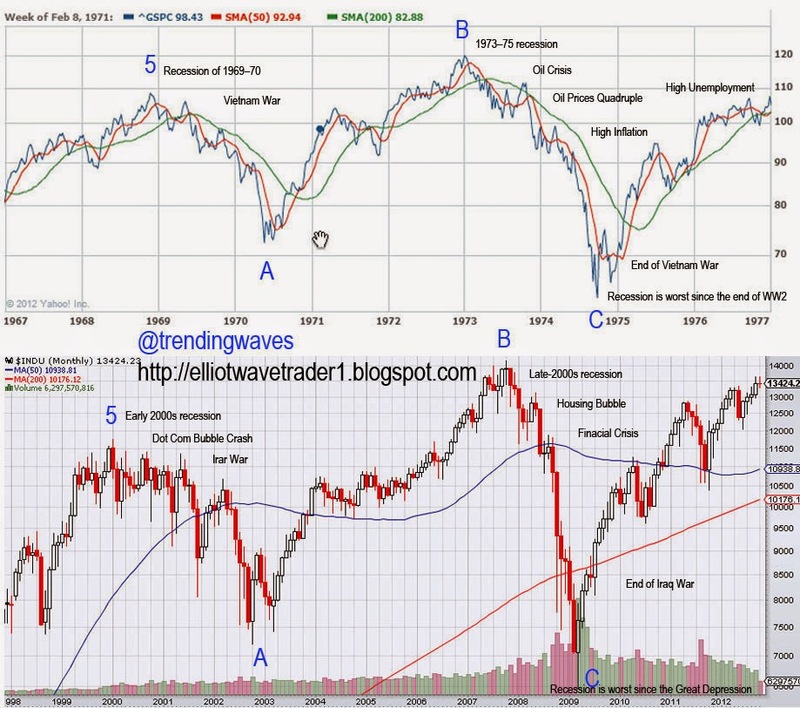 "If the market is going to behave "normaly", we should see decent bearish action very soon." 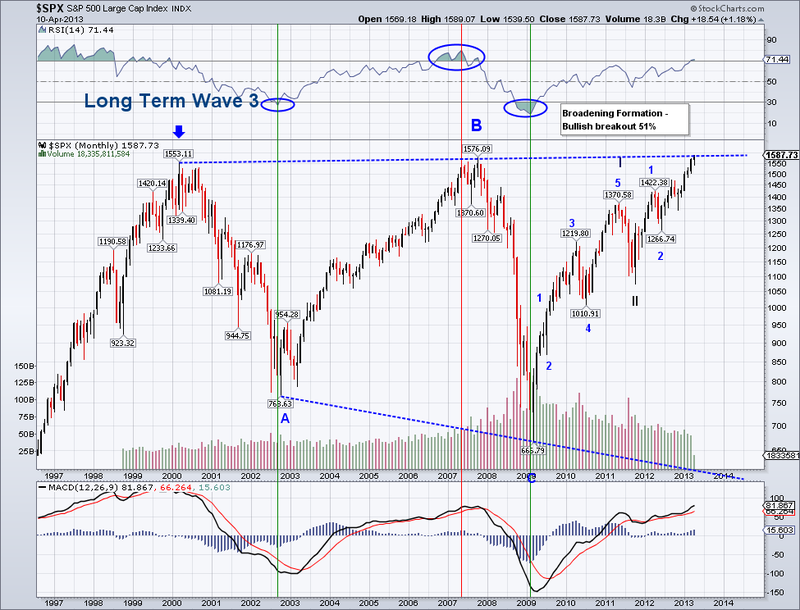 Where it gets trickier is in January, where we should see another correction after a new all time high? So far, all the excuses for the sell off have been meaningless but maybe we'll get something early next year that really scares the markets. Perhaps it will be Russia or Putin to be specific, given the extremely bad economic situation there at the moment. In fact, I wouldn't be surprised if Putin launches an all out invasion of Ukraine at all. 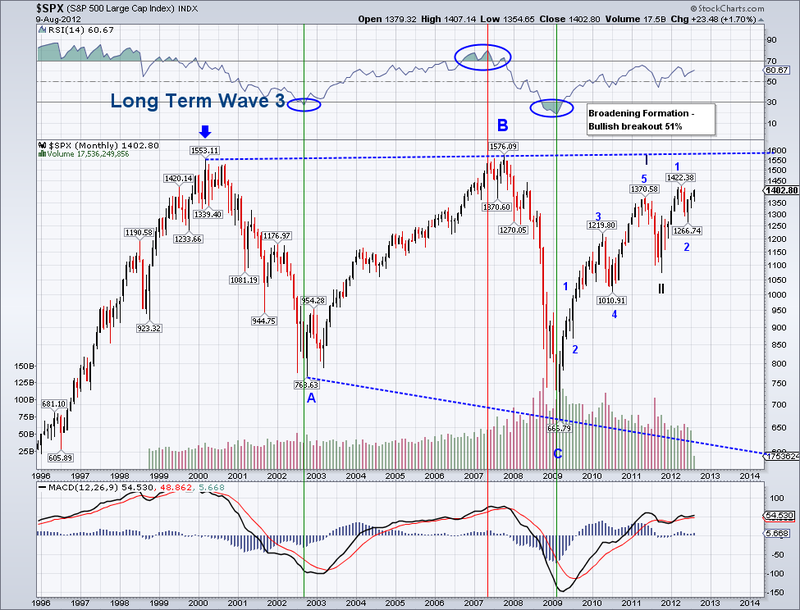 Also, I will attempt to chart the longer term waves this week and see where the market stands. Off the top of my head, I think we're in the final bullish multi-month wave which might coincide with the first actual rise in interest rates or even a mild recession that sets up Jeb Bush to win in 2016 (I think he wins it regardless). The market had a volatile day, opening at a lower low, rallying 40 points and then having all those gains reversed and closing at a lower low. The closing wave should be the end of the zig zag or a W3, so we'll find out in the next session or two if the bottom is in or this is going to sub-200 DMA. I continue to lean towards a rally due to seasonality and the lack of reasons for a strong sell off, but obviously anything can happen. Oil seems to have found a bottom of a yet undetermined degree, but if the initial counter rally is a W1 then we're looking at a mid 60's target. Which would be the excuse for a stock market rally. The market rebounded early morning as expected but all gains were reversed and the 100 DMA/support at 1977-85 was tested in what seems like the end of the structure from 2055. Ideally, there should be another bottom before the end of the correction but the market could start rallying from here. The market has reached the oversold point where it has usually turned around in the last 2 years, so that's a signal to start preparing for a turn around. Also, despite oil continuing to sell off, prices have reached a multi-year support trend that will likely produce a big counter rally. Not that oil was the reason for the sell off anyway. Some people seem to have completely forgotten the market rallied almost 15% non-stop too all time highs in a few weeks while oil plummeted 25%. Now that oil is 50% off this year's high, I see crazy low forecasts for oil which if anything, it's a sign a bottom is near. I ended up selling my hedge in the 1990's and I almost bought oil. But since I am already long, I figure my long positions will benefit from an oil turn around so I am just holding equities. I am back to 100% long until other critical levels get breached, specifically 1977-85 and the 200 DMA at 1946. Also, one ETF I am keeping my eye on is RSX (Russia), once oil and the rubble stabilizes, you might see those shares easily double. The market put in another bearish micro 5 wave count today to test the 50 DMA as I had been expecting when the daily MACD rolled over. 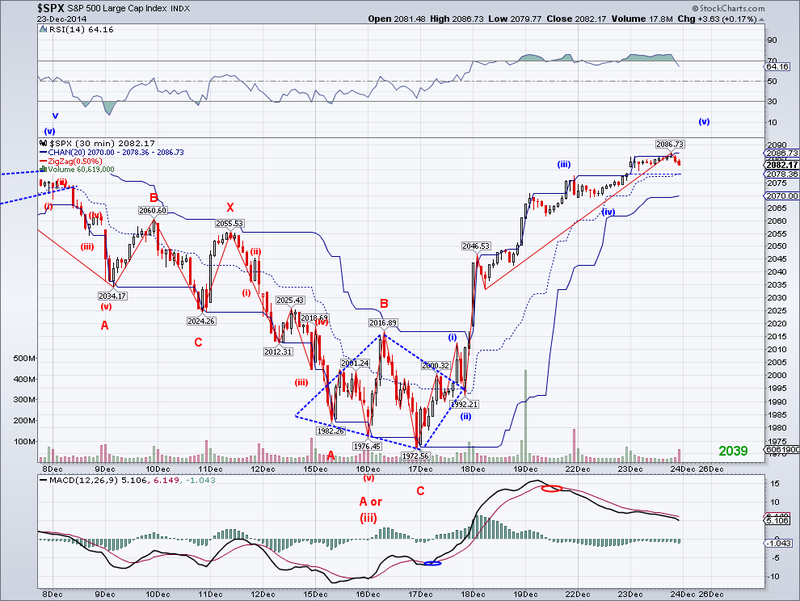 Today's wave could be another A of a zig zag or W1 of a W3, so the picture of the correction is not entirely clear just yet. The excuse for today's sell off was oil, but like I said yesterday, my guess is that a bottom is coming up very soon (which I might trade). The drastic drop in prices at the pump just translates into more discretionary spending so this whole thing is basically an excuse to sell. There is a study that was done by Barclays where they compare the additional discretionary spending vs the capital spending that would have resulted from oil co's companies. And the projection is an increase in GDP due to low oil prices. I am personally saving around $70 per month on gas (which is probably in line with the average driver in the US), so I am enjoying this price war between OPEC and Shale Oil. Anyway, I decided to sell half of my hedge at the end of the day but I was a few minutes too late. So I am holding to the entire hedge position over the weekend along with my longs. 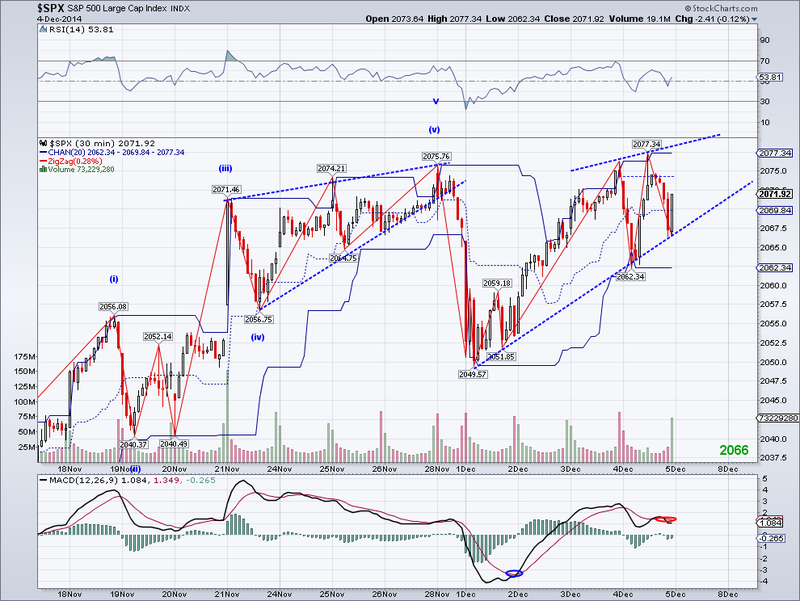 My guess is that we are seeing a double zig zag that will end next week, or just in time for a big Santa Rally. Last but not least, the now formed Inverted Head and Shoulders pattern on the daily targets 2267 so we could see a very bullish period if the pattern follows through.. never underestimate xmas/new years euphoria. The market put in a decent rally early morning to almost test the TA again before heading back down. 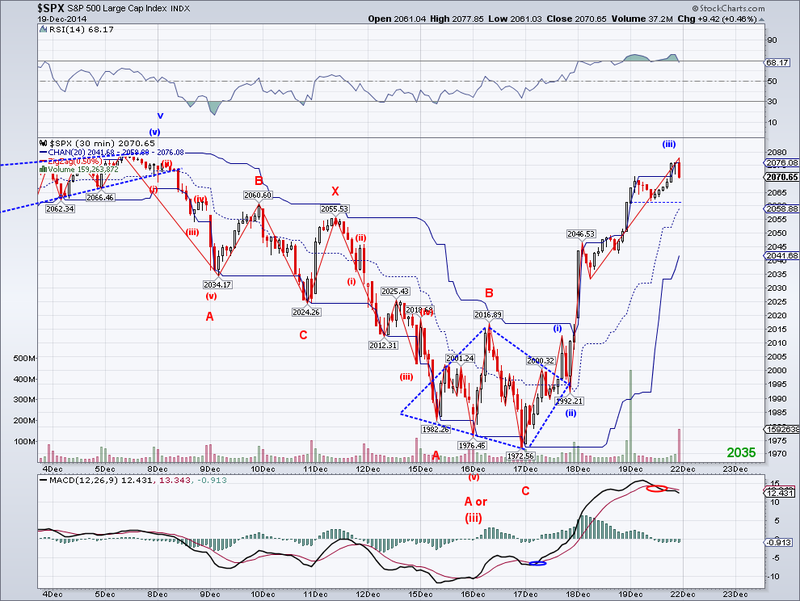 So far we have an ABC move completed, which could also be part a nested bearish 1-2 count. So unless we see strong selling soon, we will likely see the start of a new rally or a zig zag and then the start of a rally. With Oil now trading in the high 50's, odds are a bottom is getting close (for Oil) and sellers will need to find another excuse to sell. Also, we have to keep in mind that all that money consumers have been saving on gas, will likely end up being spent shopping and in turn provide a profit boost to major companies going into 2015. So chances are high we will get a strong end of the month and a strong January. The closest the market got to the TA was at the closing yesterday and today the sell off continued in what is possibly a C or a W3. As I mentioned when the MACD rolled over last week, it is very likely we will see the 50 DMA tested and that level is currently at 1993 so not all that far from where the market is now. However, should the selling accelerate, then the 200 DMA would be a better target at 1944 but that would be a stretch considering the season we are in. And like I said last week, a correction this week would set up the market for a Santa rally so while we might see further downside, the market could be making new all time highs in couple of weeks. The excuse has been China and Oil, but China will probably cut rates very soon and Oil will find a floor possibly in the 50's, so sellers will need better excuses to make their case. I was hoping to buy VXX at the TA test but since the market didn't get there, I ended up buying back SH to hedge longs. I decided to keep my longs since they're China centric and I am betting a rate cut is coming. 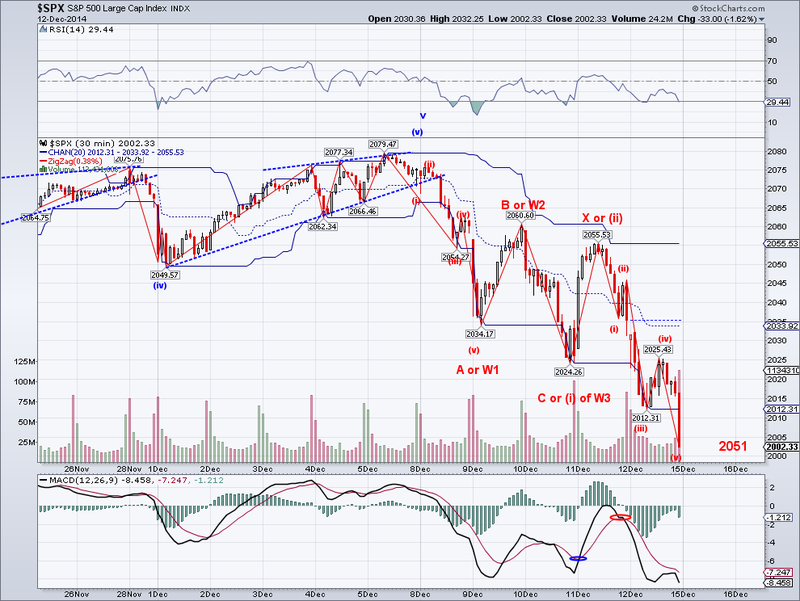 The market followed though on its wave count and the Trend Average has finally turned bearish. It seems like it took forever, but better late than never. What remains to be seen is how high the counter rally will go and the pattern that it will create. 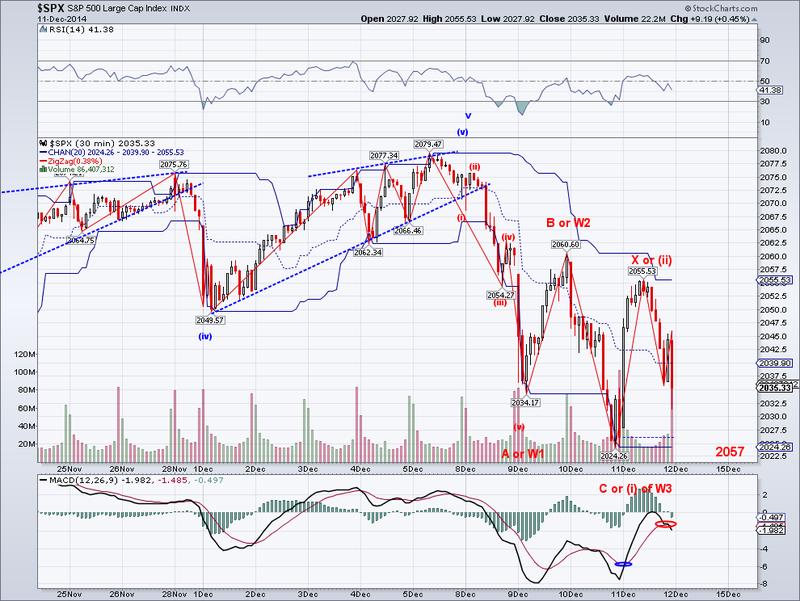 I can see the possibility of a flat or something that will challenge the TA but not overcome it on the bearish side. 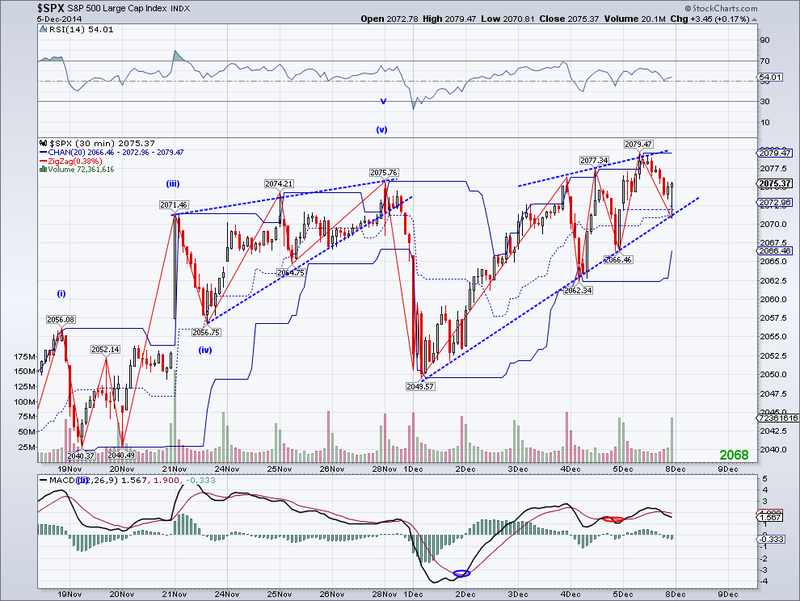 However, if the market can rally to the high then it could set itself up for an IHS. 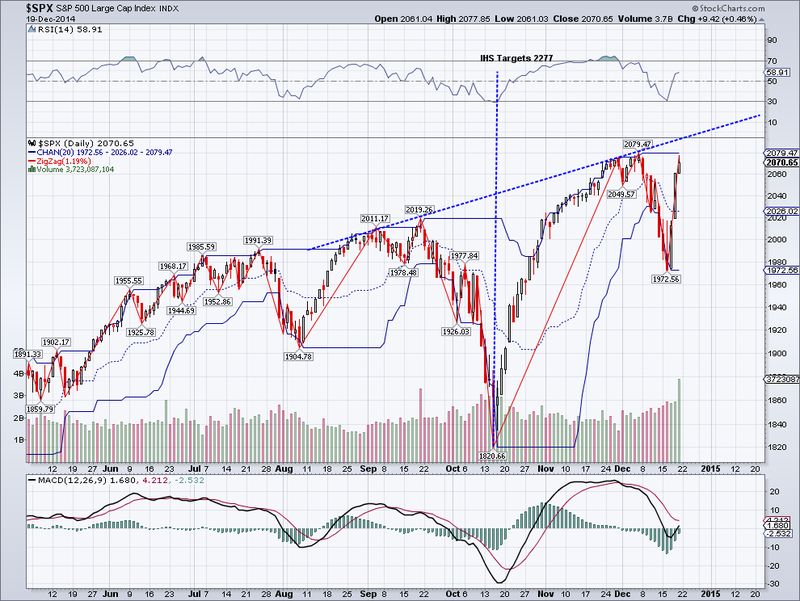 Given the history of this market making very quick corrections and rallying, this shouldn't come as a surprise. I ended up selling my hedge at a profit near the low today and will evaluate the long position in this counter rally. 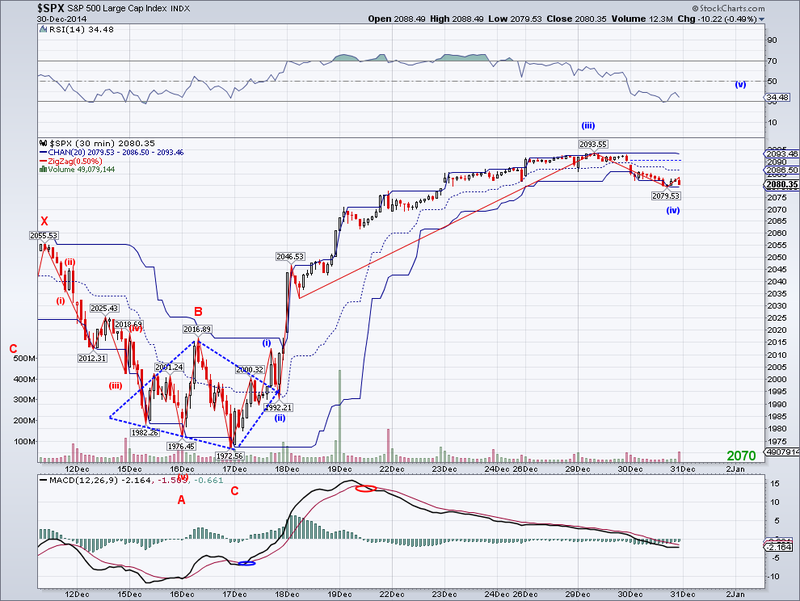 I am also planning to get the hedge (or maybe even short) near the TA in hopes the signal will not get whipsawed. 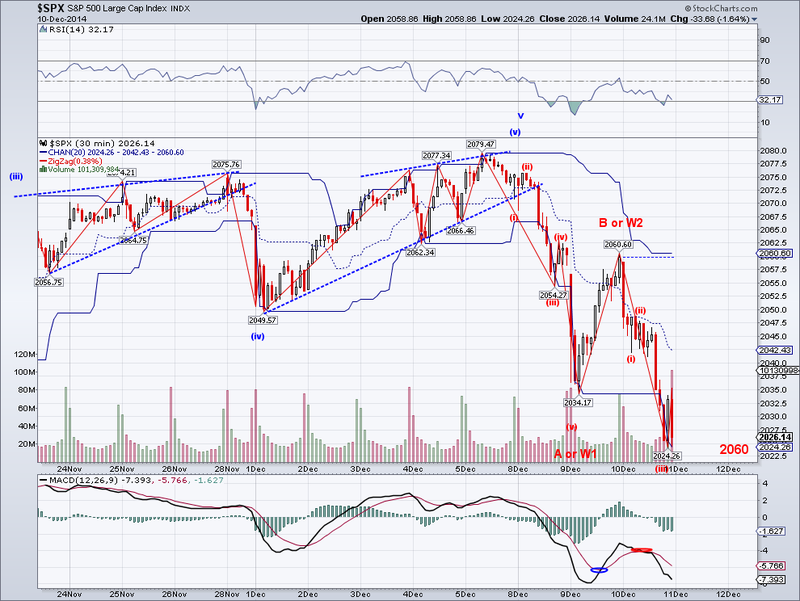 The market sold off today as expected in what looks like a potential micro 5 wave count. If the labels are correct, we should see another leg to test the 2050 support and possibly set up a neckline for a Head and Shoulders. If there's going to be a substantial correction, it should start right now so the market can position itself for a Santa Rally. 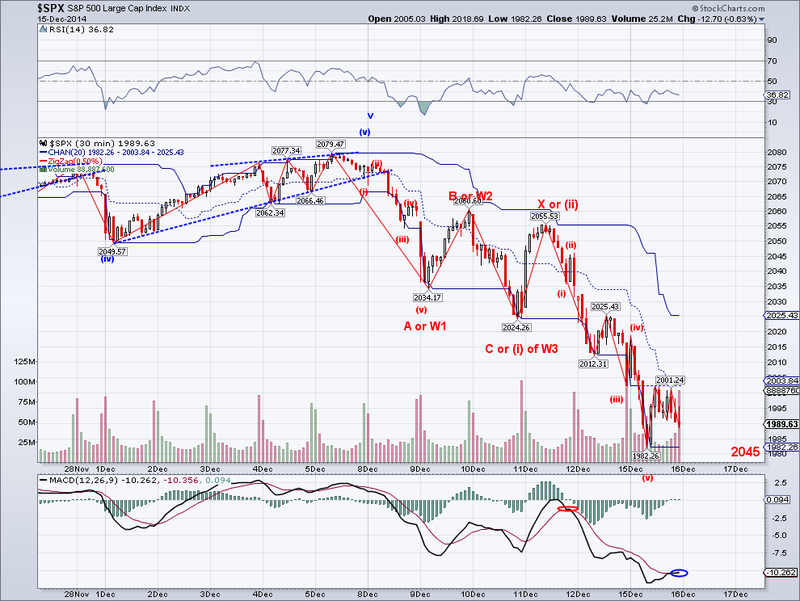 So we'll see if the Trend Average turns bearish after being bullish for 7 straight weeks. The market found resistance and support today in the rising wedge trendlines, so we might see the market break out of the rising wedge on Monday or Tuesday. If the market can sell off to 2050 and bounce from there, we could get a Head and Shoulders. Which would fit well with the bearish MACD rollover and the fact that this market has rallied 14% without any significant correction. If the bulls manage to break the wedge to the upside, then 2100 will be the next stop but I doubt it at this point.. that would be insanity. 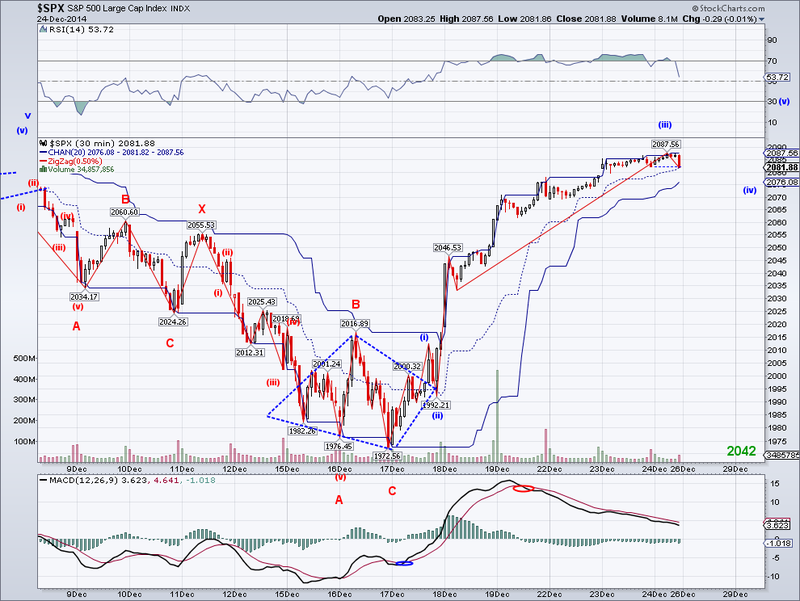 We got another marginal higher high on the SP500 today and the bearish 1-2 count was invalidated. It seems like we could be seeing another rising wedge as the market is facing overhead resistance so unless these upper levels are cleared soon, we will see the 2050 low tested. With that said, there is also an Inverse Head and Shoulders targeting 2101 so we need to see the TA turn bearish soon or else we will see more upside. I am keeping my positions intact as I am enjoying the strong rally in China (which seems to be in the early stages of a multi-year bull market) and hedging with VXX. The market almost made it to the all time high set on Friday in what looks like B so far (could still be a bearish W2), so we should see what is the bearish response as soon as tomorrow morning. Also, there is now bearish cross on the daily MACD and more often than not, we have seen the 50 DMA tested whenever we get a rollover on this particular oscillator. Currently, the 50 DMA is at 1989 and the 200 DMA at 1939. If the market is going to behave "normaly", we should see decent bearish action very soon. However, if the euphoria continues, I can see this market rallying past 2100+ towards the ends of the year easily. I am still holding to my longs just in case but I switched my hedge today from SH (short SP500) to VXX in hopes we see some excitement in the next few days. The market bounced as I had been expecting and we should find out soon if the selling yesterday was just another correction or we will see further selling as soon as the bounce is complete. Ideally, there would be a clear catalyst to scare some traders into selling but I can't really see any one in particular that is getting headlines. If anything, the news are bullish considering Japan and China are at multi-year highs and still rallying. I bought back the hedge I sold last last week just in case, but if the rally continues, I will try to position trade it again. Fortunately, my longs are doing ok since I'm up to my neck in China shares. The market finally started a correction that closed under the Trend Average, but it remains to be see if this is just one of those 20-30 point pullbacks that end up being reversed completely as we have seen 6 times since the 1821 low. Also, the catalysts for selling were not all that serious (Black Friday sales, China PMI, Oil?) so the market could snap back to euphoria after a day or two. Ideally, there would be substantial selling to consolidate gains and then get the market ready for a Santa Rally. I guess we'll find out this week if that's what the market wants to do. The market seems to have reset its short term overbought condition in a sideways move in the last couple of days and it now seems like it is ready to go to a higher high. There's simply nothing the market is fearful of at the moment and with December coming up, we might see uncontrolled euphoria if the market keeps doing these small sideway moves. That's not to say that they won't be a top, I am sure there will be one sooner than later. The main question is how much higher as this 5th wave just keep going and going. Also, with news of new stimulus coming from China and Europe coupled with a confirmed strong US GDP, the stage is set for a bullish close of the year for the US and the world. I thought about closing my longs today given the strong advance but instead I closed my hedge to position trade it. I'll buy back those shorts again when short term oscillators get overbought again on Friday or early next week if we get micro W3 which seemed to be started at the EOD.